Freshman Abby Schuele shares her passion for figure skating and music. Bright lights illuminate freshman Abby Schuele as she gracefully twists and turns on the ice. Her figure skates slice an icy path while she dances on the ice. Every jump is done with what looks like perfect ease and the clack of metal on ice echoes upon her landing. Being a kid from Minnesota, it was normal for Schuele to learn how to skate at just 3 years old. Ever since she moved to Missouri when she was nine, Schuele has taken up a passion for figure skating. 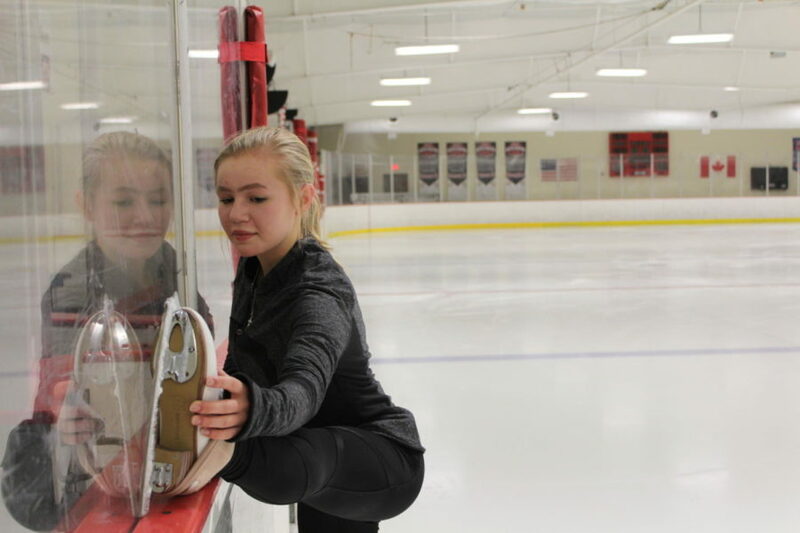 Schuele has been on a synchronized skating team for the past six years and takes lessons from her coaches Amy Fankhauser and John Coughlin at Line Creek Community Center. Schuele skates at 5:30 a.m. on Thursday, Friday and Sunday and after school on Monday, Tuesday and Wednesday. lll“This season I’m skating to instrumental music from ‘La La Land,’” Schuele said. However, that’s not the only project Schuele is working on. She’s also doing a duet with a friend to the upbeat song “Smooth Criminal” by Michael Jackson – a step up from her normal instrumental music performances. Freshman Abby Kovac has been Schuele’s friend since elementary school. However, figure skating isn’t the only thing Schuele is involved in. She’s a musician who enjoys playing the flute for band and strumming a guitar and ukulele in her free time. Schuele found her love for the guitar when she received one for her birthday in third grade. Schuele uses the musical skills she’s learned and applies them in band. Not only does Schuele practice her instruments in her free time, but she also loves to sit back and relax by watching The Office or diving into a book, her favorite being Miss Peregrine’s Home For Peculiar Children. Despite being only a freshman, Schuele has already decided what she’d like to do in her figure skating future.